Togglecard is a virtual prepaid credit-card that can be used anywhere! With Togglecard’s user-friendly back-office management functionality, you can review your balance and interact with your account anytime, anywhere and at your convenience. Simply use your credit-card to access Togglecard online, and the virtual card is ready for use. Funds can be added to your Togglecard at any time, with a simple top-up from you account. 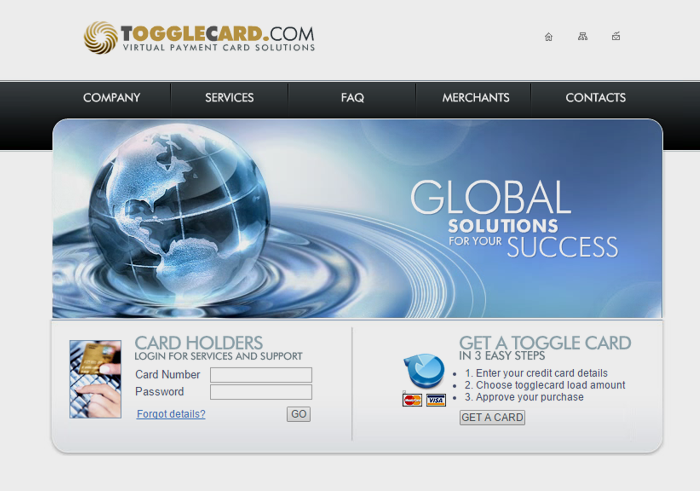 Togglecard is a secure way to purchase products and services online. With Togglecard, your internet purchases are safe, and your privacy and money are protected. Tooglecard only works with PCI certified partners, in order to ensure complete security for all our end-users and merchants.